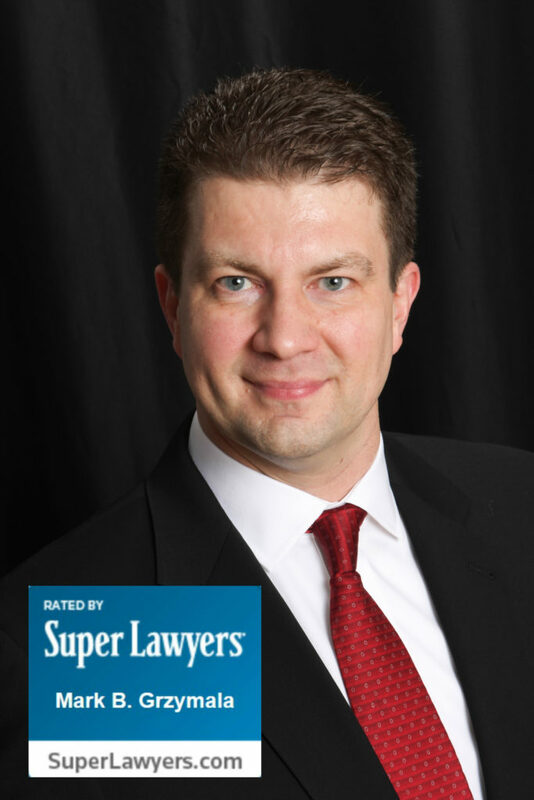 We are pleased to announce that Mark B. Grzymala, the founder and principal of Grzymala Law Offices, P.C., has been selected to the 2019 Illinois Super Lawyers list for Construction Litigation. This is an exclusive list, recognizing no more than five percent of attorneys in the state. Evaluations from a highly credentialed panel of attorneys. The Super Lawyers lists are published nationwide in Super Lawyers Magazines and in leading city and regional magazines and newspapers across the country, as well as the Illinois Super Lawyers Digital Magazine. Please join us in congratulating Mark B. Grzymala on his selection. For more information about Super Lawyers, please visit Superlawyers.com. 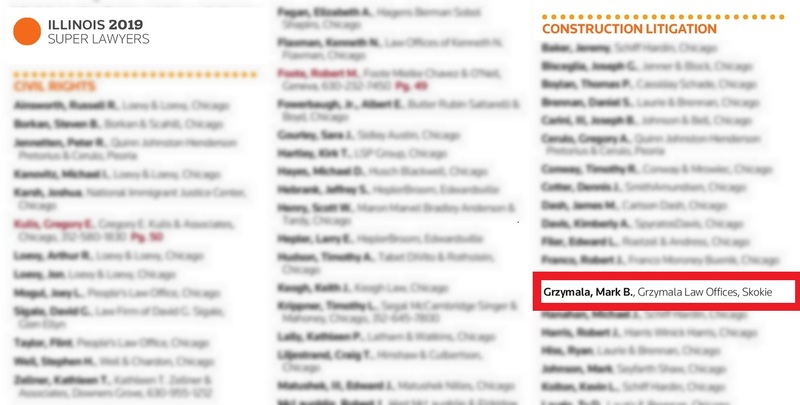 We are pleased to announce that Mark B. Grzymala, the founder and principal of Grzymala Law Offices, P.C., has been selected to the 2018 Illinois Super Lawyers list for Construction Litigation. This is an exclusive list, recognizing no more than five percent of attorneys in the state. Experienced construction attorneys Mark B. Grzymala of Grzymala Law Offices, P.C. and Beata Bukranova of A Law Team are pleased to announce they will be conducting a webinar on Current Issues in Illinois Mechanics Lien Law in cooperation with Lorman Education Services. In this webinar, the attorneys will provide a brief overview of what a lien is and its requirements along with the benefits of asserting a lien claim. They will then shift their focus to identifying the pitfalls in asserting a mechanics lien claim and present the best practices to minimize the risks in order to maximize recovery. Approximately 200 new laws go into effect in Illinois in the new year. Here is a link to a complete list of the new laws and changes for 2017. Illinois Public Construction Bond Act (HB 5660/PA 99-0673): Amendment provides that verified notice of claim from a subcontractor shall be deemed filed on the date personal services occurs or the date when the verified notice is mailed. Employee Sick Leave Act (HB 6162/PA 99-0841): Allows employees to use personal sick leave benefits for absences due to an illness, injury, or medical appointment of an employee’s direct family members (including employee’s child, spouse, sibling, parent, mother-in-law, father-in-law, grandchild, grandparent, or stepparent) on the same terms as for the employee’s own illness or injury. Illinois Freedom to Work Act (SB 3163/ PA 99-0860): New act prohibits employers from requiring non-compete clauses for low-wage employees. Under the act, “Low-wage employee” means an employee who earns the greater of (1) the hourly rate equal to the minimum wage required by the applicable federal, State, or local minimum wage law or (2) $13.00 per hour. Illinois Plumbing License Law (HB 5913/PA 99-0504): Requires licensed plumbers to complete 4 hours of continuing education each year in order to renew their license. Course might be supervised by an Illinois licensed plumber. Illinois Criminal Code. (SB 1120/PA 99-0534): New expands on theft to include failure to return equipment in excess of $500 within 3 days after the rental period has expired. Illinois Condominium Property Act (SB 2359/PA 99-0849): Prevents a condominium instrument such as bylaws or a declaration of condominium from changing the ability of the board of managers to execute bank documents by a majority vote. Illinois Wage Assignment Act (PA 99-0903): Allows employees to revoke a wage assignment at any time by submitting written notice to a creditor. Please call us at 847-920-7286 or email us at mark@grzymalalaw.com should you have any questions or wish to discuss the impact of these changes on your business. All the best to everyone in 2017!